Hello again my fellow armchair generals. I apologize for my sudden departure from the previous AAR I was doing for the 1775 British Campaign. I lost my save files so decided to start with a fresh campaign this time as the Americans in the 1775 Campaign. I am attempting to refine my turn AAR to allow more analysis and graphics. I will do away with the “in the saddle” commentary and proceed with a more top down approach to include more game mechanic and strategy discussion. The rebellion is in its infancy as can be seen from the starting forces of both sides. With main forces of the Americans and British concentrated at Boston in New England where the discontent of the colonists runs very high. The main American army sits at Dorcester Heights bottlenecking the small but professional British Army in Boston. The American force is composed entirely of militia and lacking in proper leadership to handle so many men. They do however hold high ground with strong entrenchments and are well supplied with supply trains and a depot. A small force of militia also occupy Bunker Hill. Analysis of starting forces- Strong starting position with entrenchments and supplies. Lots of militia that are expendable to a certain degree (these militia will form the nucleus of the Continental Army). Outnumber the British more then 2 to 1 in men. Good interior lines with only enemy forces in Boston and Canada to start. However, they are militia and no match against British regulars in prolonged engagements. Only one battery of artillery. No sea going vessels save for a few bateuxs scattered around the theater. Lack of high level commanders (Major General) to command the forces given. Good mid level commanders (Colonels) for smaller detachments if needed. Standard militia with weak discipline and cohesion. There are a lot of them to start however. American elite units are rare and should not be wasted. Good discipline and cohesion. As Marines, they come with the very important river crossing ability that gives the Continentals the mobility it needs. Strategy for prosecuting the war and Turn 1 Orders up next. Our number one priority is survival of the main army in the coming months and years as we patiently await the arrival of the French army and navy to turn the tide. We will sacrifice space for time and keep our forces mobile and in the field. There is no region, city, fort, etc worth sacrificing a sizable force to hold against a superior enemy. The British advantage will appear in early 1776 as their main armies arrives from Europe and they go on the offensive to engage our army and take key cities. New York, Philly, and Boston in the north and Charleston, Savannah, and Wilmington in the south. I am considering an unorthodox strategy for this campaign and to see how it plays out. My idea is to place the majority of my forces in the south below Philly and perhaps farther south as well. The enemy is sure to take New York city as it is very vital as a supply/port and in cutting off New England. Although New England is where we garner the most support it can be a trap if the enemy controls the New York, Albany, Boston regions. The terrain and weather is softer in the south allowing my forces more mobility and areas to retreat if the need arises. I am not planning any absolutes as of yet since we are very early in the war. It will start to shape up as the months go by. However in 1775 I do have some degree of offensive spirit and the enemy is on the defensive. Limited offensives to keep the enemy off balance and force them to react i.e. going after certain objectives and/or smaller enemy detachments. With these considerations in mind and the enemy standing still in Boston awaiting more forces here are my orders for the month. Gen Thomas with around 6500 men and 16 guns will assault Boston. I have no illusions that I will destroy the enemy. The idea is to hit them hard and use up their valuable ammunition before Gen Howe arrives in the next few turns. Long term the British cannot hold Boston with a large force since it is only a size 2 city with no depot. My militia are expendable and I have replacements available. This will give them pause that although we are militia we are not afraid to fight. Gen Ward with around 3000 men will move to Hartford in the interior. Their destination is Philadelphia and will pick up the volunteers and supplies in Hartford first. The start of my southern focus will be to mass the main army around Philly. Stark and his regiment move to Bunker Hill to meet up with Warren and his command. Lexington volunteers at Worcester move to Bunker Hill. Two river bateauxs at New York will move up the Hudson to Albany. Cape Fear bateaux at Wilmington will move to Georgetown and link up with the other bateaux there. Gen Thomas went in as ordered. The militia performed admirably facing off against the redcoats behind their earthworks. The fighting was heavy and we sustained a good amount of casualties given the circumstances. Gen Thomas withdrew after taking around 1400 casualties and inflicting close to 400 on the enemy. A good trade off to start the war in my opinion. My militia are easier to replace then British regulars. All other orders were conducted with no issues. Colonel Warner with irregulars and some militia secured Ft. Ticonderoga and a transport fleet there. Gen Schuyler mobilized a force in Albany. The US Army is born as the 5th Continental regiment. 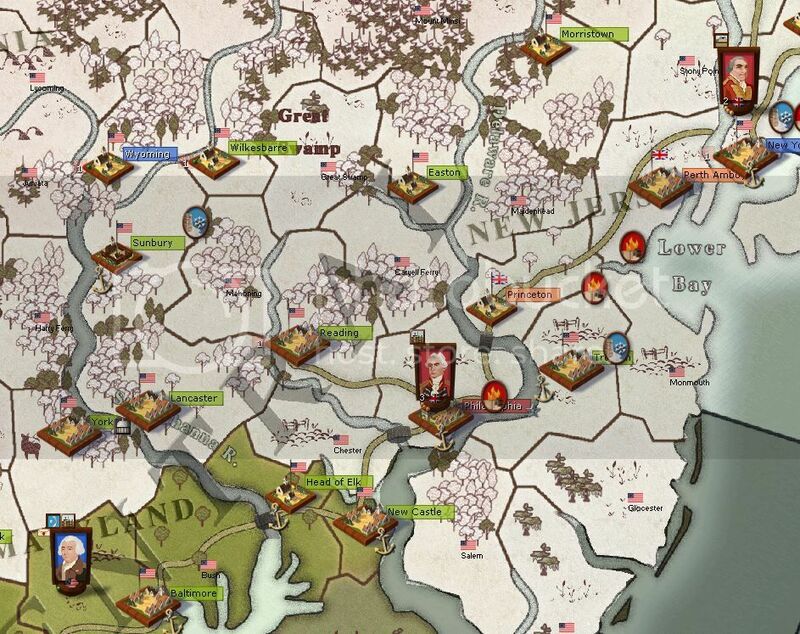 The Continental Congress, angered by Canada refusing to join our cause, has authorized an invasion north. A regiment of militia secured Ft. Henry near Pittsburgh. Gen Ward, moving with caution last month is still outside Hartford. This month he will continue his march moving on Danbury. The Harford garrison will link up with his forces there. Gen Thomas will spend this month resting at Dorcester recovering from the attack. The 4th Connecticut regiment at New London will march to join him. Colonel Warren and Stark with around 2000 men will hold Bunker Hill for the time being keeping a show of force around Boston along with Gen Thomas at Dorcester. The level 4 entrenchments at Bunker Hill are worth defending for the time. Gen Schuyler will hold at Albany. Seth Warner holds Ft. Ticonderoga. I do not expect any enemy attacks this turn. My attack on Boston unlocked the enemy force but I do not foresee General Gage launching an attack on either the Heights or Bunker Hill with his small army. I do expect Gen Howe to arrive this turn giving the enemy twice their numbers starting next month and giving him some flexibility. No actions during the last month. Gen Ward is slow moving and his troops are losing cohesion as they endure the long march to Philly. Gen Thomas holds Dorcester with around 5200 men. Colonel Warren is deeply entrenched with 1900 men at Bunker Hill. Gen Howe arrived with his army giving the enemy a large force at Boston. Congress decides to print paper money. Multiple leaders and units appear in theater. I have received leaders and units for the historical invasion of Canada. Arnold, Montgomery, and Morgan are all excellent leaders with unique abilities. Overall I believe the Americans have better leaders then the British although troop quality is reverse. Utilizing these leaders effectively will be very important. Despite the urging of the Congress and the people, I am not going forward with a Canadian offensive. Force strength, terrain, and the weather advise against it. However I do plan on moving forward with a view to taking Ft. Oswego on Lake Ontario. This will secure the Mohawk Valley and threaten Ft. Niagara and Ft. Detroit. I will also reinforce Ft. Ticonderoga as the first line of defense opposite enemy forces at Montreal. Gen Ward will hold at Norwalk to rest. Militia regiments at Danbury and New York will move to link up with Gen Morgan at Philly. Gen Montgomery will move to Ft. Stanwix on the way to attacking Ft. Oswego. Virginia volunteers at Williamsburg will move to secure Yorktown after the departure of Lord Dunmore (I assume he is moving to Norfolk). I have spent 5 engagements points to raise two militia replacements. No actions and all orders were performed. Gen Washington takes command at Norwalk adding more leaders to my pool. Generals Sullivan, Lincoln, and Lewis are good commanders. General Lee although second in command has poor abilities and I plan not to give him command as I have plenty of leaders available. The enemy is still sitting at Boston. I will keep my forces in the vicinity to keep them bottled up unless they move to force an engagement at either Dorcester or Bunker Hill. Washington will keep the main army, now supplemented with another regiment of regulars and a dragoon regiment, on the move to Philly keeping to my strategy. If the enemy leaves Boston my forces there will move to occupy the city. If they reinforce or strike elsewhere (I am expecting an amphibious landing to take New York soon), I can flex my two commands. General Arnold's command will move to Portsmouth with its fort and heavy guns or move west to reinforce Albany. General Thomas at Dorcester will skirt west along the New England coast or move to Hartford/Springfield regions. Both commands will form the nucleus of my northern army with a base of operations in Albany. Gen Washington, with his very fast mover ability, takes the main army into Philly this turn. Gen Sullivan will detach and move to Dorcester giving this command a fast mover if things get ugly at Boston and I am forced to retreat. Gen Montgomery will move and assault Ft. Oswego. Seth Warner and his raiders will move north near Ft. Chambly to recon enemy strength at Montreal. 3rd New Jersey militia regiment activated at Morristown will move to Philly. Gen Montgomery moved into Ft. Oswego with orders to assault and a sharp fight ensued, however his militia were to exhausted from the march and thus a siege developed. Lt Col Willet has arrived at Ft. Ticonderoga holding the fort with the 5th Conn and Vermont militia regiments (960 men). Washington sits at Philly with around 9800 men, mostly militia. More importantly, the enemy went on the offensive as General Gage and Howe moved on Dorcester Heights engaging Gen Thomas. Heavy fighting raged and Gen Thomas was eventually forced to withdraw under duress from enemy dragoons. The force made it to Peabody with the enemy in hot pursuit and another battle erupted. Gen Arnold, always ready for a fight, committed his command to help Gen Thomas to no avail. Exhausted and low on ammunition the militia melted and were once again run down by British cavalry. The retreat ended at Dorcester again while Gen Arnold withdrew to Bunker Hill with his men. Total losses were 3254 men and 1 cannon. The enemy suffered 1260 casualties. Colonel Moultrie mobilizes at Charleston although he is locked for 5 turns. Ft. Ninety Six is active as rebels and tories appear. Gen Montgomery will keep the siege going at Ft.Oswego. Col Lee will move to Richmond linking up with the 1st Virigina regiment and the Virginia volunteers moving from Yorktown. 1st SC Regiment at Charleston and the 2nd Georgia at Ft. Ninety Six, will converge on Orangeburg south of Camden. Gen Arnold and his force (around 2500) are under siege at Bunker Hill by Gen Gage. He will defend at all cost although Gen Gage's command is sure to be suffering from low cohesion and ammunition/supplies after the last month's engagements. An assault is unlikely. Gen Thomas has around 1100 men and is severely low on ammunition. Gen Clinton is in Boston with a few fresh regiments. I would prefer to hold the heights and keep the two enemy forces separated however I doubt Gen Thomas can hold against another attack. He will withdraw south avoiding battle to New London. The enemy has given battle near Boston instead of embarking and moving for New York City or Philly. Although we took the worse of it, the enemy did suffer a good deal of losses. His next sizable reinforcements are not until next spring. I have noticed the British navy is not in port at Boston, leaving this small and now bloodied army isolated. Gen Washington with almost 10,000 troops is moving in that direction now reaching Hartford in 22 days estimated. If they stay in in New England I will give battle with the superior numbers. I detached Gen Lewis (5-3-2) to head south and take command of militia units in the south. Gen Montgomery was successful in taking Ft. Oswego as the enemy was kind enough to leave the fort intact and allow us to capture a transport bataeux in the process. Gen Thomas avoided engagement and moved his battered militia into New London as the enemy moved back into Dorcester from Peabody. Seth Warner and his men moved into Richelieu near Montreal and managed to destroy the fort that was present before two enemy regiments (7th Royal Fusiliers and 26th Cameronians) appeared. A sharp fight at Ft. Ninety Six as loyal Tories forced our men to withdraw. Charleston takes in 80 naval guns to help with the defense. Gen Montgomery will hold at Ft. Oswego. The capture of the enemy transport fleet does give us new options however we do not have the forces to carry out other attacks at the moment. Seth Warner will move back towards Ft. Ticonderoga avoiding a fight with the regulars. Col Allen will move to Albany. Gen Thomas will hold in New London this month. Col Lee is moving on Petersburg from Richmond threatening Norfolk. Col Campbell will move to Salem from Hillsboro with the 1st NC militia and link up with the NC volunteers moving up from Crook's Creek. Their objective is Charlotte. Gen Washington is moving to assault Dorcester Heights. Gen Howe is in the town and his force has a power of 162 versus Washington with a power of 723. The rest of the enemy force is in Boston. I will take the chance that they reinforce Dorcester or perhaps abandon it. Either way I am moving to force a fight and make them stand or leave New England all together. The rest of the enemy embarks and lands at New York City taking siege. Another enemy force seems to have moved out of Norfolk inland and has taken Hillsboro. I feel a tactical mistake as Norfolk is now unprotected and I have forces to the north and south of the enemy. The British are seemingly aggressive to this point with their forces however they are small and my militia are plenty and all over. All other orders were carried out without issue. With the enemy leaving only loyalist militia, Gen Arnold will go in at Boston and secure the city for the cause. Gen Washington will move to link up with Gen Thomas at New London. The Chesapeake transport squadron is picking up some of the battered militia regiments there and sneaking to Philly to unload them. Col Allen will move to link up with Gen Montgomery at Ft. Oswego. Col Warner is moving down to Ft. Ticonderoga to resupply. The enemy seems content to defend Montreal and I do not expect any advances from Canada anytime soon. With the enemy out of Norfolk, Col Lee will attack and secure the town. Col Campbell is moving on Charlotte. Gen Lewis holds at Camden with the nucleus regiments for the Southern Army. With 20 engagement points I invest two artillery units. A few developments the last 30 days. The enemy split forces and now have a force in New York and Philadelphia laying siege to both cities. A small enemy force also moved on Boston from New York although Gen Arnold, after securing the city, was able to beat them back. The decimated regiments moved into Philadelphia hoping for some R&R only to find themselves under siege now! I now find my main army where I did not want it, in New England without a major supply center and winter is setting in. However I took that chance in order to destroy small enemy forces and I was successful. Col Lee secured Norfolk and Col Campbell is holding Charlotte in the south. Gen “Mad” Anthony Wayne and his light infantry appear near Philadelphia. He is very valuable with the training officer ability. Gen William Woodford and Col Crawford appear in Fredericksburg with two regimens of militia. Gen Knox and his artillery appear at Ft. Ticonderoga. The US Marines are formed. 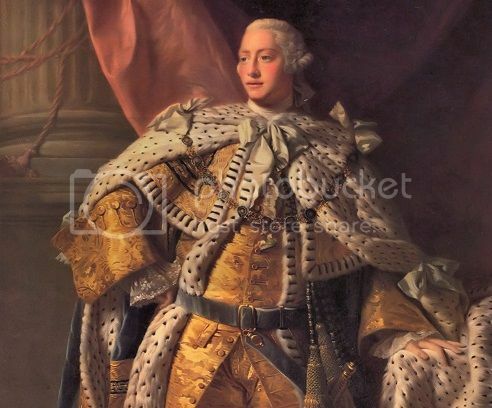 Lord Dumore frees slaves in Virginia. Enraging the colonists even more. Gen Washington will move to Boston clearing out the small enemy force at Dorcester and linking up with Arnold's command. Next turn I will lose militia as they go home for winter and I did not have enough engagement points to extend militia service. Therefore I need to consolidate my forces and hold what I have. Gen Wayne will sneak through Philly and link up with forces at Baltimore. I feel both garrisons at New York and Philadelphia are on their own and I will lose the cities soon. Leaving one regiment to secure Norfolk, Col Lee will march to Petersburg. I will wait to see what the enemy in Hillsboro does this turn. All other commands will hold positions. Gen Washington attacked at Dorcester again destroying some weakened enemy regulars and militia then linking up with Gen Arnold at Boston. The enemy is still besieging New York and Philadelphia. Winter is in full swing across the northern colonies. The enemy announced amnesty for my middle states militia. Next turn I will lose some of my regiments as their terms of service expire. Therefore I am holding all commands this month awaiting to see what happens. The loss of New York and/or Philadelphia is expected as the Americans do not have the force to hold everything. I must conserve my troops now as the enemy will get his major reinforcements this year. I purchase two militia replacements for 5 ep. Gen Clinton is still besieging New York City to no effect although our garrison will soon be out of supplies and a surrender in imminent. Gen Howe secured a breach and attacked us in Philly. AG Otho Williams and the depleted militia fought bravely but they were overwhelmed and we lost the capital (loss of 5 nm). The Continental Congress evacs to York. A total of 24 regiments disbanded as their terms of service expired. Easily a large portion of my forces and the enemy will only grow stronger this year. I expect to lose New York this month and with the enemy holding Philadelphia as well, almost splitting New England from the rest of the colonies. My main focus now is moving the main army at Boston inland. Albany is my only depot I control in the north. Getting my regular regiments trained and in en mass is a priority as well. Attempting to hold any of the coastal regions and cities is, in my opinion, suicide. With the main enemy forces arriving soon and British control of the coastal waters, they can strike anywhere from anywhere with superiority of force. Moving inland and keeping mobile is key now with limited attacks in the south and west to secure objectives as I lose the coastal cities and victory points. Gen Washington will move to Dorcester Heights with the main army of 7500 men and 48 guns. Col Moultrie with his regiment and supply train is taking a bateaux to Camden. I am moving Gen Lewis at Camden down to Savannah where 2nd Savannah militia and 1st Georgia Inf appeared. My plan is for Gen Lewis to take this force and move on Augusta while Col Moultrie holds Camden.